You don’t have to spend a fortune at the nursery or garden supply center to have a happy and healthy garden. There are a few things you probably have lying around the house that can put some extra green in your thumb—and many of them are items you might otherwise consider trash! Coffee Grounds: What’s better than starting the day with a strong cup of coffee? Saving those coffee grounds and using them as compost, of course! Coffee grounds are an excellent addition to your garden; simply spread them directly onto the soil. Don’t worry about coffee grounds being acidic—since acid is water-soluble, it stays in your coffee and out of your garden. Coffee grounds improve soil structure and anecdotal evidence suggests that the grounds keep slugs and other pests away. As a bonus, you can even shred used paper coffee filters and throw them into soil as well. These act as a carbon source and make your soil even richer. Toilet Paper Rolls: I’m willing to bet you regularly use toilet paper, and that means you have a steady supply of free seed starter pots at your fingertips. Simply take an empty toilet paper roll and cut it in half. Take one of the halves and cut four slits approximately an inch up the roll. Fold the toilet paper rolls into each other to form the base of the seed pot, using tape to secure. Layer your soil and seed inside. Once the seed is ready to be planted, you can simply cut off the bottom of the toilet paper pot and plant it directly into the soil, where it will break down over time. Lemon Rinds and Eggshells: An even easier, completely natural, no work seed starter is a lemon rind or an egg shell. Just poke a hole into the bottom of wither of these for drainage, sprout seeds and then plan t directly into the soil. The peels and shells will not only break down easily, but they will also provide nourishment to the soil. Beer: Instead of throwing out the dregs of your beer, put them aside in a cup. Once you’ve gathered a few ounces, take the liquid to your garden and make a slug trap. Put some of the beer into a wide, shallow jar buried in the soil. Slugs like beer so much they will crawl right into the jar and drown (not a terrible way to die, IMHO). Empty your slug traps often and prop up a jar top with a stick to prevent rainwater from diluting the beer. Broken Pots: It’s no fun to break a pot, but when accidents happen, find a way to make the most of it. Instead of throwing away broken pieces of ceramic or terracotta, use the shards as plant markers to label the plants in your garden. Identify areas where labels could be helpful, then break the broken pot into enough pieces for your project. Try to keep them roughly the same size for uniformity, but feel free to be as creative as you like. Use a permanent marker or paint that won’t wash off in the elements to write the names of the plants (if your handwriting isn’t great, a stencil might come in handy). Try out a few positions before sticking the label firmly into the ground. 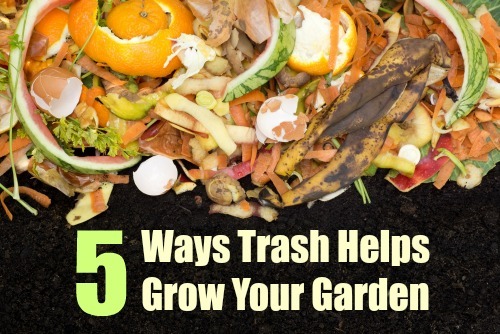 These tips are win-win—you can feel good about minimizing waste and helping your garden at the same time. Happy recycling!